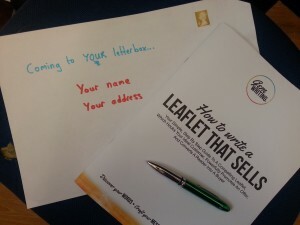 Thanks sooooo much for ordering a printed copy of my ‘write your own’ leaflet kit – the first topic in my upcoming Content That Connects series. I’m so pleased that you’ve made this investment. I hope it helps improve the quality and effectiveness of your leaflet content and I look forward to your feedback when you’ve put the kit through its paces. I know you’re itching to get started. But as this is a printed product you’ll need to wait a little longer before you can get stuck into the exercises. So in the meantime I have TWO BONUSES for you to get your teeth into. Yay! How to Write Words that Sell – this one-pager contains 15 copywriting tips and techniques, which you can use in your leaflets to help increase the effectiveness of your copy. Who’s the Right Who for You? – this comprehensive template asks a stack of questions and forces you to dig deep so that you can get super clear on who you want to buy your products/services. I strongly encourage you to complete this template as the ideas and insights you uncover will improve all your marketing activity. Mr Postman is coming to your door! Now that your order has been received, I’ll be popping it into a big white envelope and whizzing it out by first-class post. All things well, you should receive your A4 workbook in a day or so. In the meantime, if you have any questions feel free to contact me.